You’ve narrowed your choice of buying a new barbell down to Eleiko, but can’t decide between the Competition Bar or the Training Bar. It’s all in the details. Eleiko lists the dimensions at Weight 20 kg; Length 2200 mm; Grip 28 mm; Sleeves 50 mm. Our testers double checked those and found some discrepancies. First, and probably the most important, is the weight. We used a calibrated scale and found the bar to weigh more than 20kg. It was 20.4kg, or 45 pounds. Secondly, the bar diameter where the knurling is located is thicker, with an actual measurement of 28.2mm. 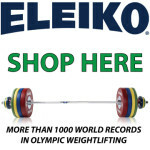 Eleiko manufactures both the Training and Competition barbells with ten needle bearings. They use their top-secret “Swedish steel”, which prevents the bar from remaining bent, even after quality testing with 1000+kg. The barbell returns to its original shape without any distortion whatsoever. This bar’s beautiful finish shines like a new car. The chrome plating is excellent. The finish, knurling and attention to detail once again assure you that you are holding one of the finest bars in the world. The overall grip and feel is excellent. When compared to lower quality bars, there is no comparison. The knurling is sharp. A novice might initially find this slightly uncomfortable, but experienced lifters welcome it. After grabbing Eleiko’s Powerlifting Barbell, the grip seems mild in comparison Traditionally, Olympic Weightlifting barbells have a smoother center knurling than the main gripping area. This barbell is no exception. The center is smooth enough to not shred your neck, but rough enough to not slip during a Clean or Squat. How a Weightlifting bar spins is crucial. No spin and you will be slower under the bar or injure your wrist. Too fast and you might dislocate your elbow or not have a good “feel” for the weight. The Training barbells spin is well above average, but not as free spinning as the Competition model. Upon testing, it rotates 18% less than its big brother with identical force applied. Eleiko claims that the Training Bar and Competition Bar both have ten precision bearings, but obviously there must be some significant internal difference in the manufacturing tolerances. The Training Bar also seems more “stiff” than the Competition model, giving it less “whip” or oscillation. This must be the difference between “Special Swedish Steel” and “Swedish Steel”, and also where the additional weight must be hiding. We had both beginners and elite lifters use this bar, and only the elite lifters could notice any difference between the Training Bar and the Competition Bar. None of us could put our finger on any one thing, but we all felt that the bar simply had a feel that was inferior to the Competition Bar. Quite possibly it’s the combination of the girth, weight, spin or flex — whatever the case, it simply feels inferior. Even though the additional weight and girth are very slight, they still exist. Quality and feel can’t be measured in mm or mg. If you are in the market for a bar that will last you a lifetime, and this bar is in your price range, you can’t go wrong. It will out perform just about every bar on the market in every way. However, if you can afford to spend the additional money for the Competition Bar, don’t even hesitate. The overall feel justifies the additional investment, not to mention that if you ever host a meet, you will have a calibrated / official bar on hand. 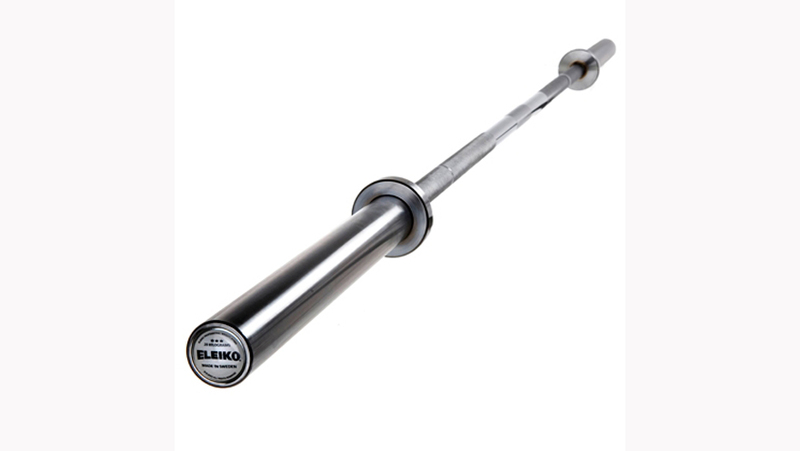 Do you have mens eleiko 20kg training bars in stock? Will you be reviewing the Eleiko Sport Training bar? thanks for your time….I look forward to your reviews and really appreciate them. Thanks for the informative article, tell me, what is the diameter of the competition bar’s sleeve collar, (i.e. the section which prevents the plates from going any further on the sleeve), and is there an official IWF specification for this dimension? There’s lots of info for the overall dimensions for an IWF approved Olympic bar in terms of overall length, sleeve diameter etc. but I have yet to come across a standard for the diameter of the sleeve’s collar. 50mm is the spec for the sleeves.